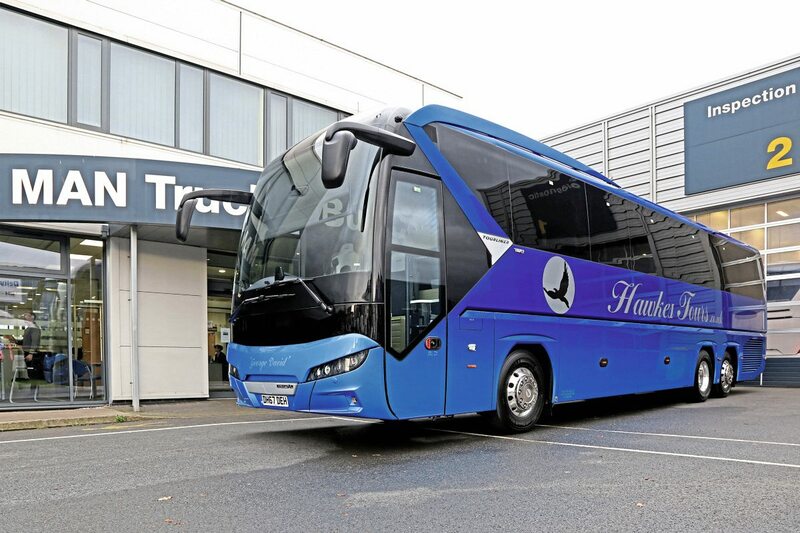 Hawkes Tours has the honour of being the first operator to place an order for an individually-specified new Neoplan Tourliner, handed over officially last week. 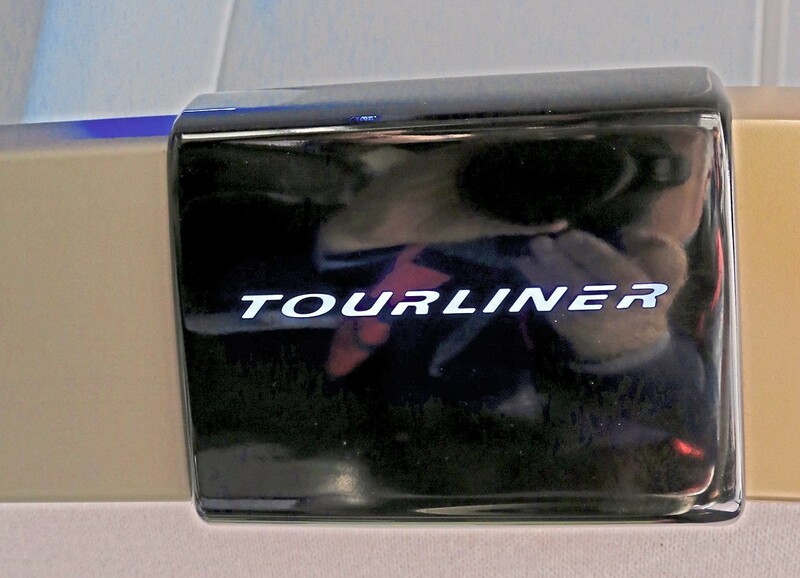 Launched in left-hand drive markets in 2016, the attractively restyled new Neoplan Tourliner soon attracted attention from UK operators with orders placed before the first right-hand drive example arrived in time for the 2017 UK Coach Rally in Blackpool. Hawkes’ vehicle arrived in the UK alongside the initial batch of 13 stock vehicles to a variety of specifications, the majority of which have already been sold. Looking to upgrade the company’s premier touring coach to meet the latest emission standards, Director Chris Hawkes was impressed not just by the restyling but also the service received from MAN when the company bought a Starliner in 2013. “We have been looked after very well by the local MAN dealer, HRVS in Ripley. They carry out our servicing and understand our needs, they are very easy to work with and this was a key factor in us choosing MAN again,” said Chris. HRVS are part of MAN’s nationwide dealer network and have received the accolade ‘Dealer of the Year’ in the past. 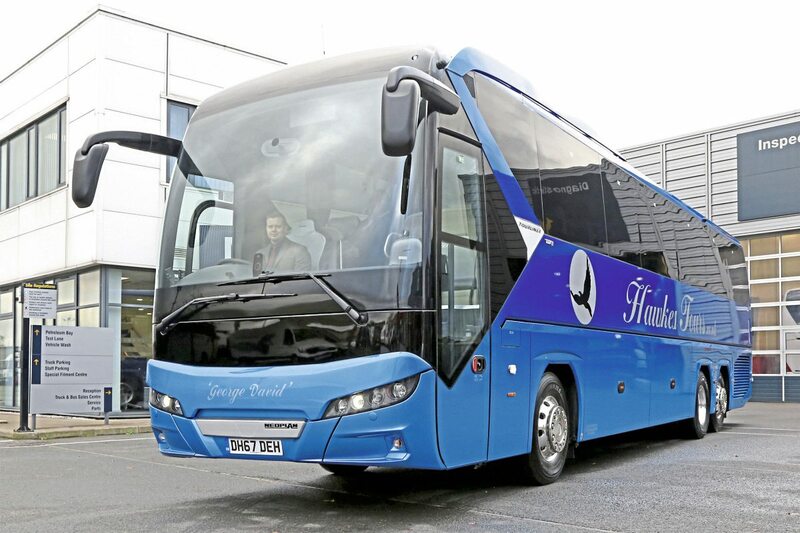 Discussions on Hawkes Tours specific requirements commenced in November 2016 and the order for a 13.373m Tourliner C was placed in January 2017 following a visit by the Directors to the Ankara plant to see the assembly line and finalise the specification. This builds on the lighter colours of the standard Tourliner interior using a grey and silver theme for seats, curtains and fittings. 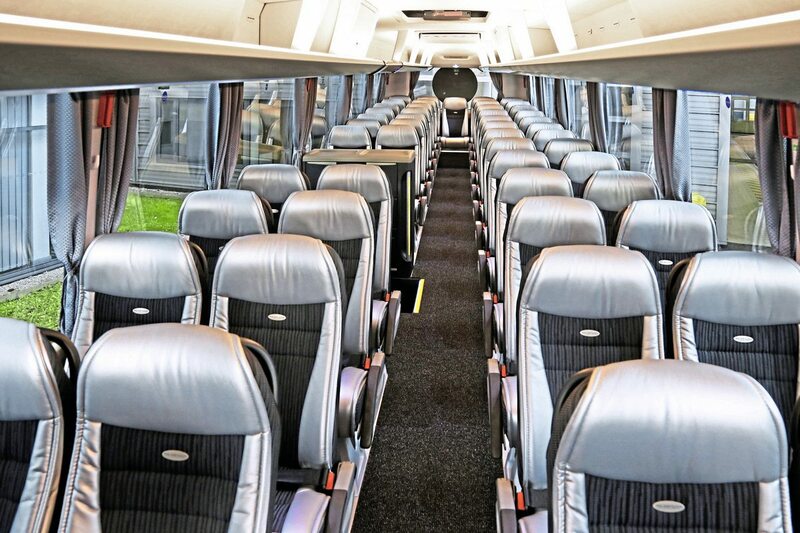 Exclusive top-of-the-range Kiel Avance 1020 seats with lap belts are provided for 53 customers, two less than the standard Tourliner C specification giving extra leg room. The seats are trimmed in fabric with headrests and sideflaps in silver Ultrafabrics material. Chris noted that customers frequently commented on how the sideflaps added to the comfort of the seat. 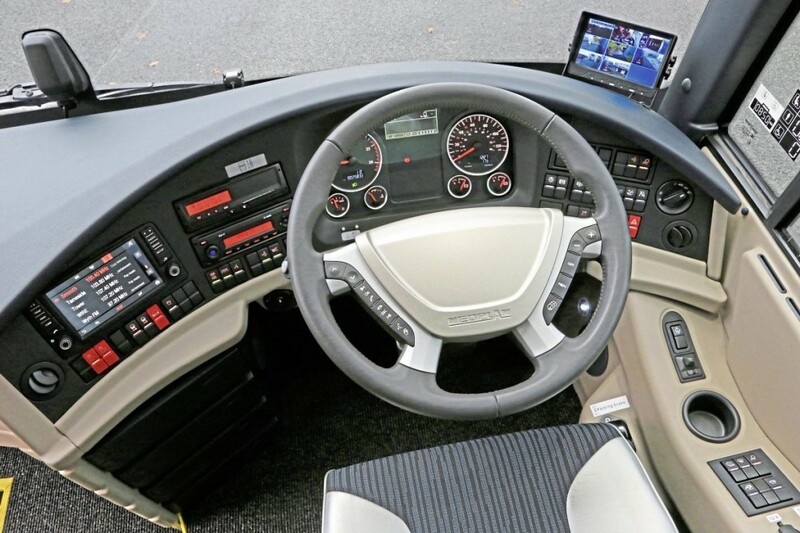 The driver has a high-specification heated Isri seat which, like the courier seat, is trimmed to match the passenger seats. 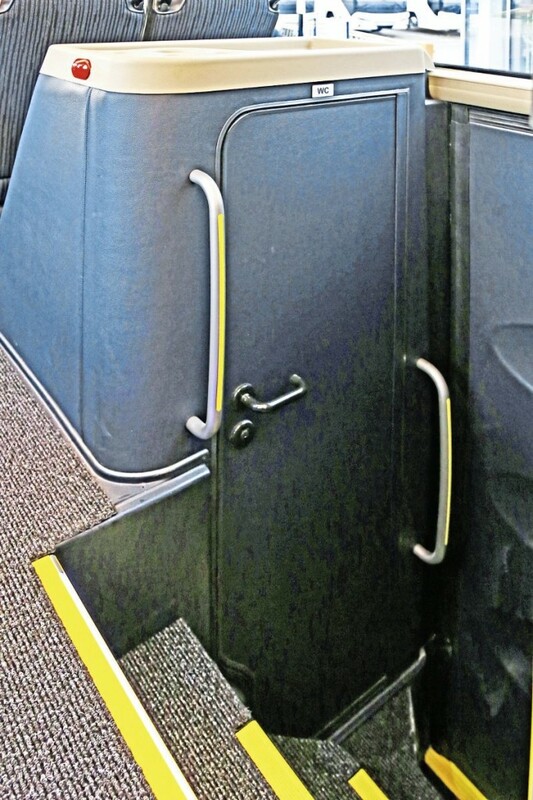 Chris’ mother, Dawn, was particularly impressed by the range of glitter effect wooden floors and one of these features in the vehicle together with blue illuminated Tourliner logos at luggage rack level, further adding to the individuality of the vehicle. 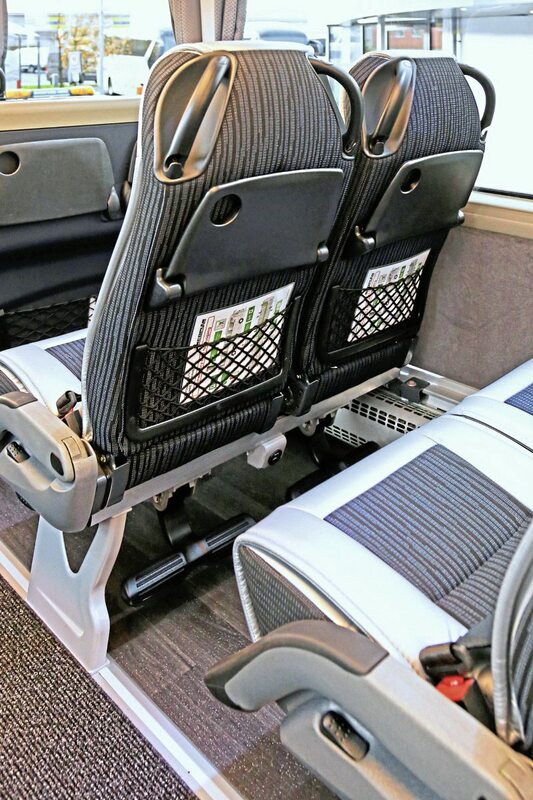 A full entertainment package is installed together with USB connections at every numbered seat and a 240V power supply under the seat immediately in front of the centre sunken toilet. 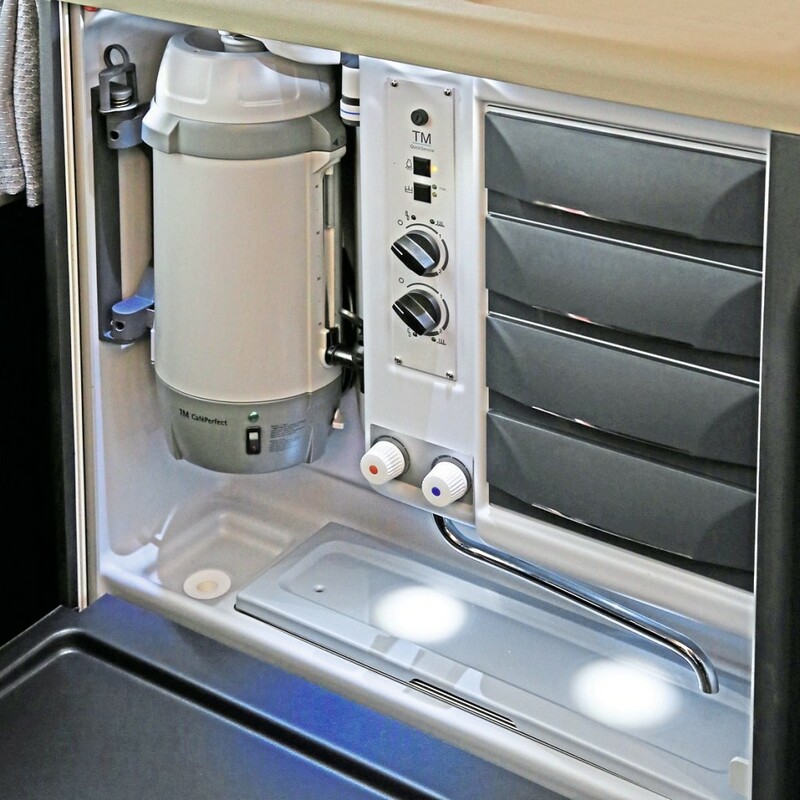 Opposite the toilet is a servery area with coffee machine, water heater, sausage boiler and fold down cover that provides a preparation area. Following completion of build with the fully specified interior in Ankara, the vehicle was delivered by ferry to Italy then overland to the UK where the exterior livery was applied and AD Coach Systems of Stoke-on-Trent installed a full eight-camera CCTV system. 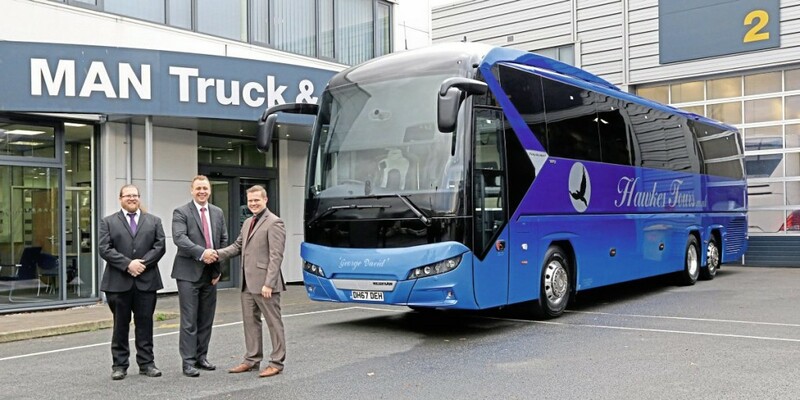 The vehicle was handed over at MAN Bus & Coach UK’s headquarters in Manchester where, alongside the traditional champagne and flowers. MAN’s Senior Retail Coach Sales Executive Matt Jacob also presented Hawkes Tours’ Directors, Chris and James Hawkes, with a large model of a Tourliner completed by apprentices in the Ankara factory. Matt also provided a comprehensive overview of the vehicle’s functions, noting particularly some of the operator actionable warnings which could appear from the extensive onboard vehicle monitoring system. 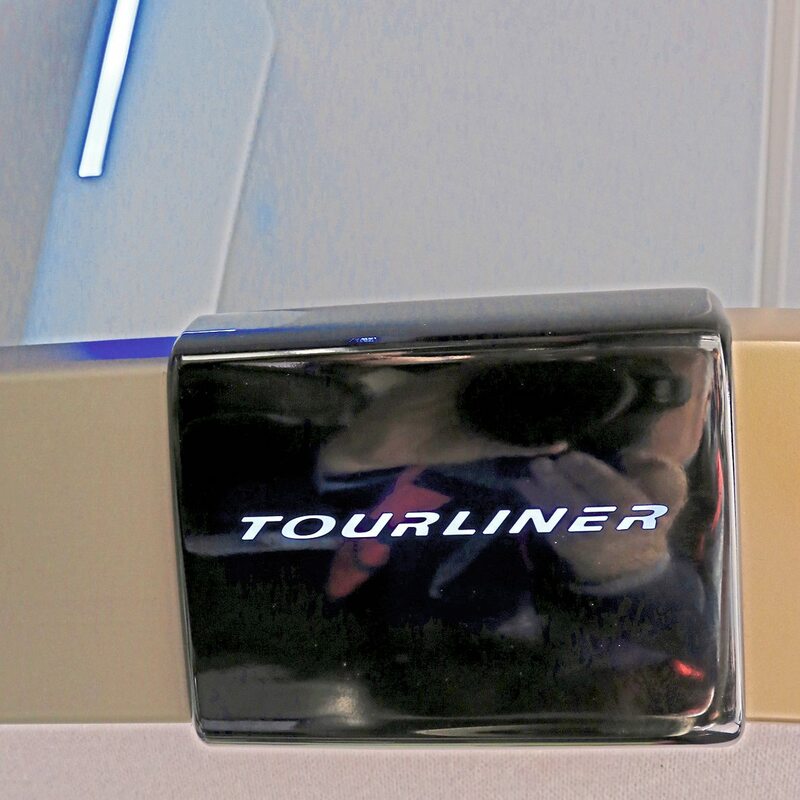 Three variants of the new Tourliner model are currently available in the UK with a fourth to follow in 2018. 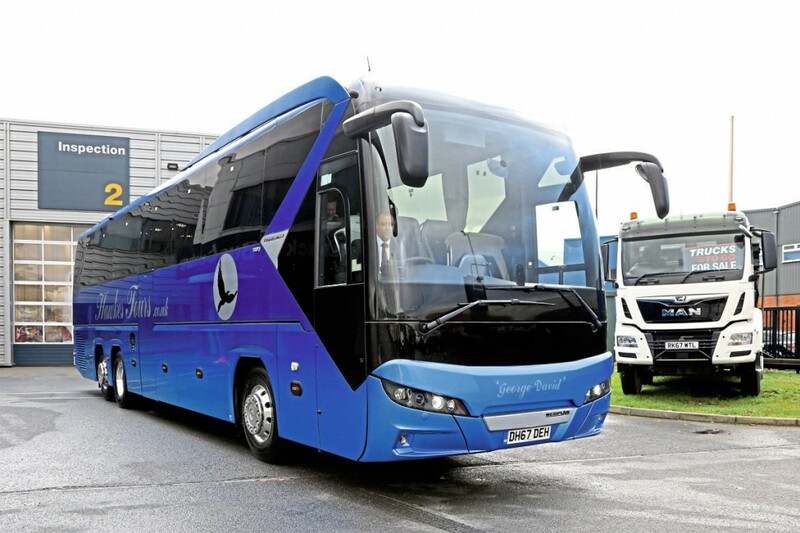 Alongside the Tourliner C as supplied to Hawkes Tours, there is the standard 12.1m two axle Tourliner and the 13.9m three axle Tourliner L. MAN announced during its 2017 pre-Busworld briefing that a two axle version of the Tourliner C at 13.1m was also to be produced in right hand drive to take advantage of the anticipated movement to 19.5GVW for two axle vehicles. All Tourliners meet the latest ECE-R.66.02 strength of superstructures regulations and feature a range of technology based safety systems. 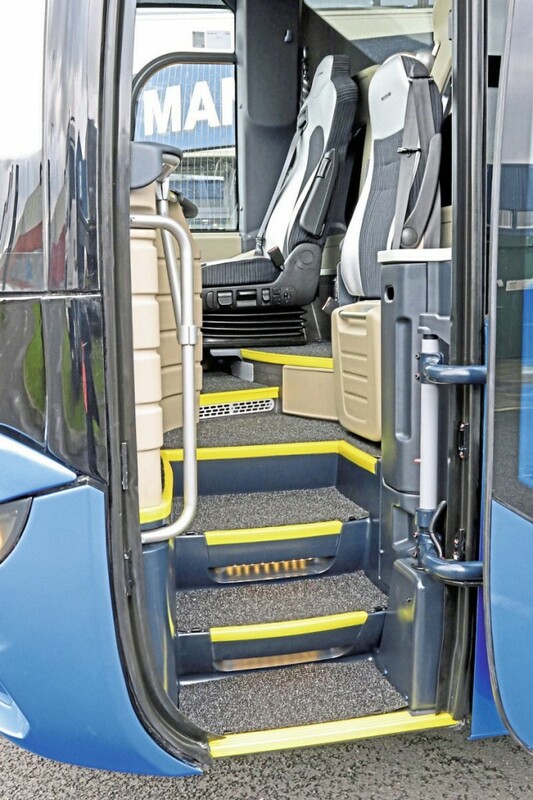 Matt Jacob advised that MAN has listened to customer feedback in the development of the new Tourliner leading to refinements such as the flat floor, individual air blowers and lighter colours throughout. 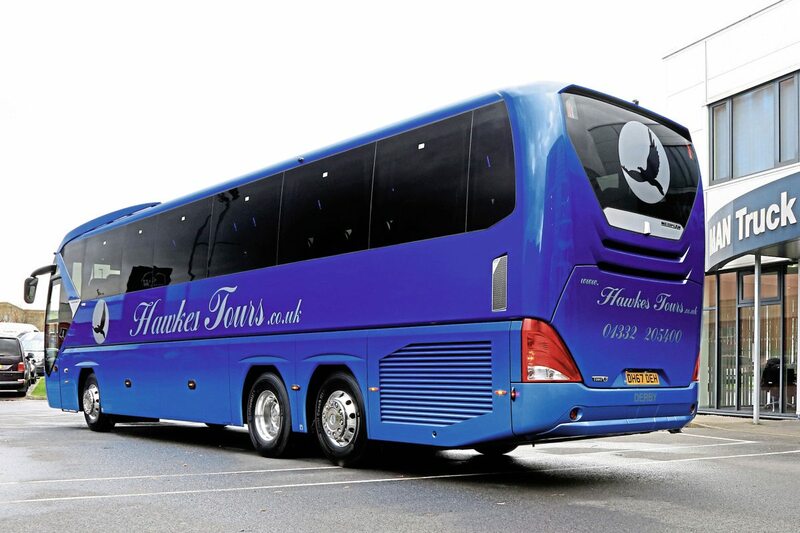 Hawkes Tours is a family business established by David and Dawn Hawkes with themselves and sons Chris and James as directors. The company specialises in quality day tours using high specification vehicles alongside a portfolio of private hire, contract and schools work. 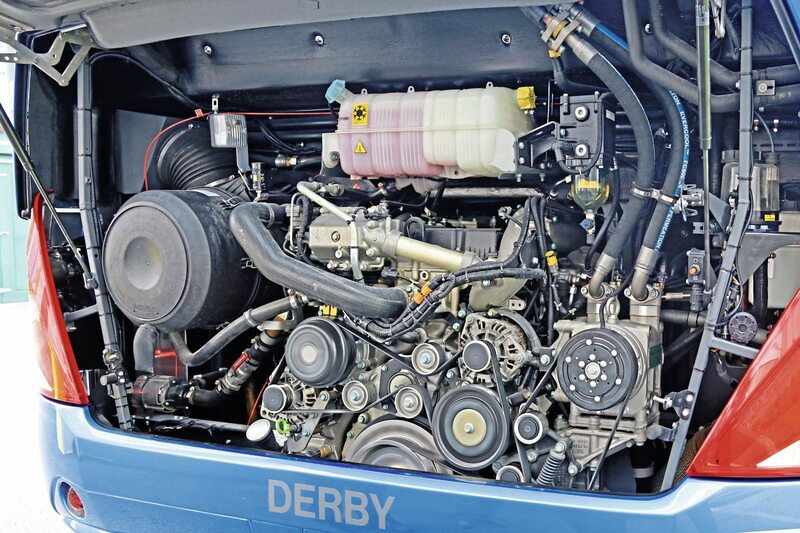 It maintains a high profile in Derby through its tours office in the city centre and the distinctive blue fade livery of its tour vehicles. The current fleet of 11 vehicles includes three double-deckers and a number of high capacity coaches for school activities.